Set in the unique village of Tatsfield is this delightful, refurbished restaurant. 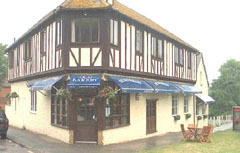 Charming and very tastefully decorated, with a comfortable, modern bar area offering a selection of daily bar meals. The restaurant features lunch and dinner table d’hote menus which change daily. Bring the family for Sunday lunch at The Bakery with a selection of traditional roasts. This is also the perfect venue for weddings, private parties and business events. Open Tue-Sat 12-2.30pm and 7-9.30pm. Closed all day Mon and Sun eve. All major credit cards accepted (not Amex). No service charge. Regularly changing fixed price menus for both lunch and dinner featuring both Modern British and European Cuisine together with bar meals served every day.